With all of our wintry weather lately, I've been cooking lots of soups, stews, buttermilk biscuits and just all around comfort foods that we crave when it's cold outside. Yesterday I realized that I hadn't made a fruit salad since Christmas and it really sounded good. When many people think of fresh fruit salad, they think of the berries, melons and peaches of summertime. And while those are so very good, we can have fresh fruit salads in the winter also! Of course, it depends on what is available in your area. This recipe is an adaption of one I found in a 1997 Southern Living cookbook and it allows for a lot of variety. The fruit is drizzled with a light syrup made with fruit juices and keeps really well for a couple of days, unless you use bananas. Bananas taste great in this, but if you use them they will need to be removed from the salad before the next day as they will turn brown and mushy. Combine sugar, cornstarch and ginger in a sauce pan; gradually whisk in water and juices until blended. Bring to a boil and stir constantly over med. heat until till syrup thickens, about 1 minute. Remove from heat and let cool while you prepare the fruit. 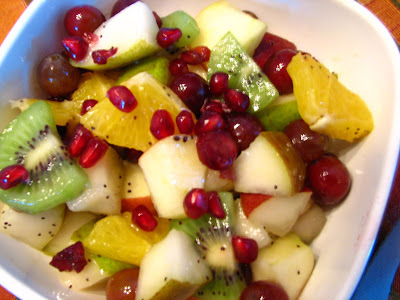 I decide what fruit to use by what looks good in our local grocery store.For this particular salad I used 2 small Gala apples, 2 pears (one was red), 1 orange, 2 kiwi, 1 cup red seedless grapes, about 1/4/cup of dried cranberries and some pomegranate seeds. Wash fruit well and dry. For the apples and pears, I cored, sliced and cut them into chunks in a bowl. I peeled the orange and cut it crosswise into rounds and then each round I cut into fourths.The Kiwi was cut in rounds and then in half. Mix in the grapes and dried cranberries with a wooden spoon. Pour syrup into fruit and stir gently. Pour into a pretty salad bowl or into individual dessert dishes and chill until ready to serve. Sprinkle with pomegranate seeds before serving. Eat and enjoy! Hey I took a look at your blog after you left a comment on mine. This salad looks fabulous! I am always looking for something else to put pomegrantes in. 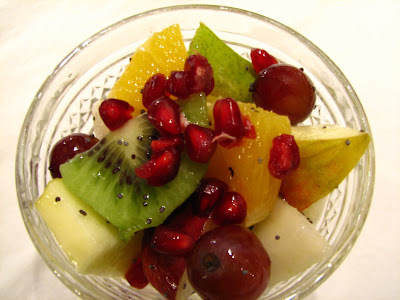 I love this fruit salad - the colors and flavors are excellent. The pomegranate seeds are a great addition. Thanks Laura and Pam for the comments. I am looking for more things to do with pomegranates as they are so delicious and healthy! I make fruit salad all year round. My hubby is more likely to eat fruit if it's all cut up for him. In the winter I love to use citrus fruits, mangoes, pineapple, grapes, cherries, apples, and pears, all subject of availability. I don't put any kind of a sauce on them, but I imagine a sauce would be super yummy. I love pomegranate juice but am not fond of the seeds, though everyone else seems to be but me. Made this salad tonight and loved it. :) Thanks for sharing.